Once more, if you are developing for round 2, be so kind to share few words about your work and what we can expect. There are some prebuilt executables in the Bin subfolder. Currently there is not much you can do as I need to work more on the game engine and the player programing has no front end! However you can zoom & rotate the orthogonally rendered Voxel scenery. Does anyone see that block of code printed in the console? That is not my program, that is YOUR program. As PlayerN you are the developer of software that can be used to control these Robots. Anyone else doing anthing for round 2? I'm going for it. I failed round 1. damn it if i fail round 2. If I do I'll camp on an island for a couple of years green arrow style. Deadline extended until 8th of April. Only one week left to go. Guys, and light at the end of the tunnel? It is nice to be back because my last competition was in 2012. I am sure you can remember . It is again an old style but Shooting Game this time. 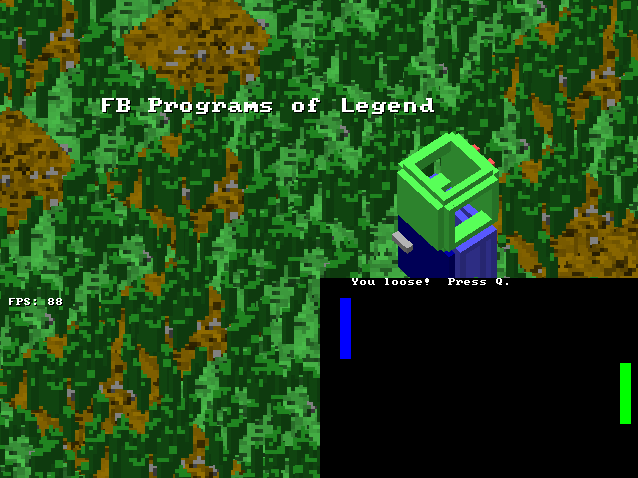 the World of Freebasic from Alien forces. The cities have limited quantity of Weapon and Shield available. precise by destroying all ships and Bomb from the enemy fleet. Bounties are side missions offered by the Cities magistrate. Grab as many energy block as you can to increase your bank value. Grab specific letters to form the word FREEBASIC and gain extra $$$. Get bonuses in exchange of your money to help you win the game. Thanks for joining the competition. Great news! This seems like it will be an excellent addition to it. Here is my final Work. !!! Good Luck to All !!! Downloaded it, but a have to boot Windows to try I see. Maybe later. FXG861, very nice work on that entry. Got canned two times at level 3, though. Time limit seems to be the biggest obstacle so far. How did you generate the female voice? Nice stuff. Lachie, Thank you for your nice comment. Since the Closure date is soon but not there yet, i decided to make a little adjustment in my Game. So i increase "a little bit" the life time of each level. I don't want the game difficulty to be judge mainly on a timer limit. Please save the "Freebasic World" and achieve all 8 levels.